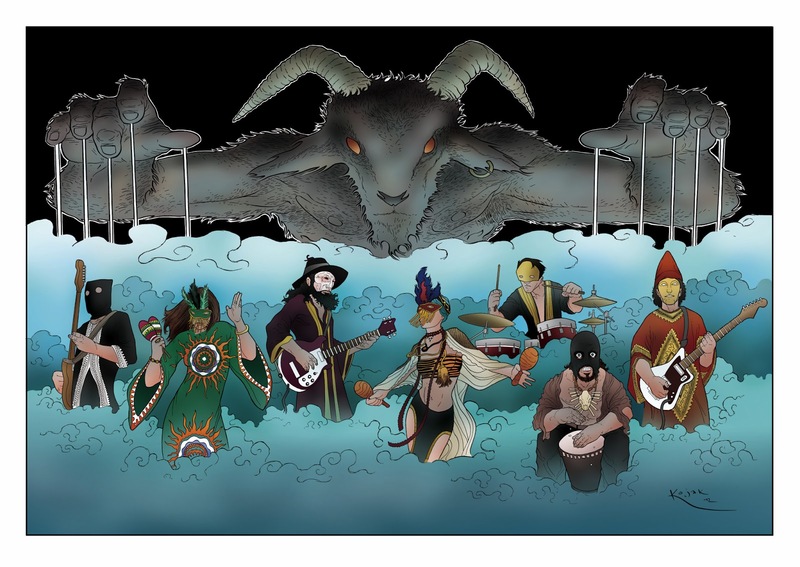 And after the interview the website did with us at Rocket, Head medicine have asked Goat some questions and drew a great illustration of the band to accompany it. "Last year at this time, virtually noone knew about the music of Goat. they were a band hidden away in an isolated communal village in deepest Sweden called Korpilombolo, a village with a mysterious voodoo history. music has always been a large part of their commune's way of life and Goat claims to be continuing their ancestral musical collective consciousness, still heavily influenced by the voodoo rhythms of the past and assimilating music from every corner of the globe to create a revolutionary mix of sounds, void of trends or styles or genres. 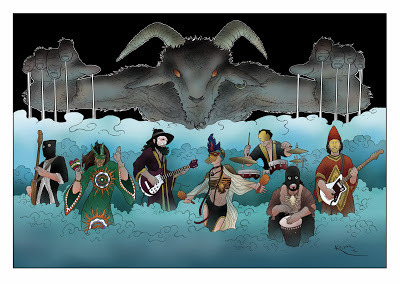 Goat's debut full length album, "World Music," has been universally acclaimed by people with taste around the world, landing on many reputable year end best-of lists. until only recently, they had never performed live outside of their commune, but they are now bringing their music to the rest of the world, putting on a handful of amazing live shows in europe and preparing to carry it over here to america for a series of dates as well in the spring. the first sounds transmitted to the outside world by Goat was on the "Goatman" 7" single released by the psychedelic UK record label Rocket Recordings in February of 2012 (check out HEAD MEDICINE' interview with Rocket HERE, which details their discovery of the band). the song is utterly amazing and was the easy choice for the Song of the Year..."